Race to your freedom. Your hands are on the wheel. Your heart is pounding. You are the citys MOST WANTED, caught in an endless police pursuit. 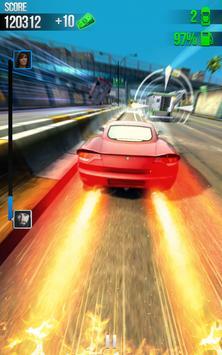 Are you fast enough to escape the cops in the hot pursuit of this actionpacked racing game ? Youre a runaway driver caught in a highspeed police car chase with the citys fastest police cars. Fire up the nitro, avoid traffic, and collect cash as you race through the city. 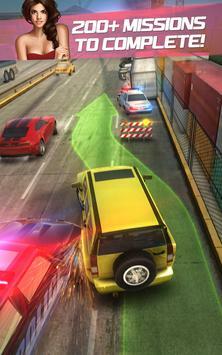 Driving your getaway car in this police chase game is easy with intuitive tap or swipe gameplay. Enjoy stunning HD graphics as you race cars through downtown streets, industrial harbors, and vast canyons! But dont let that distract you. Those police cars are on your back! Never back down as you race through 200 adrenalinepumping racing missions. Refuel on the go, dodge police blockades, and catch the elusive money truck to cashin BIG! The more wanted you become, the more cash you earn the hot pursuit never stops! The most wanted deserves the hottest rides. Choose and customize cars from 10 different models, including speedy sports cars and powerful trucks. As you levelup and collect cash, unlock custom looks to customize your car and drive the hottest ride on the road! Use your cash to unlock boosts and powerups like nitro to escape any police car chase, or wrenches to fix your race car on the go. Are you the good guy‌ type? Rather be behind the wheel of a cop car? With this new feature, you can now be on the right side of the law. Take part in a hot pursuit as the police chase the most wanted and bring them to justice! Highway Getaways online leaderboards with Facebook integration let you drive to the top and compete against your friends and global leaderboards. 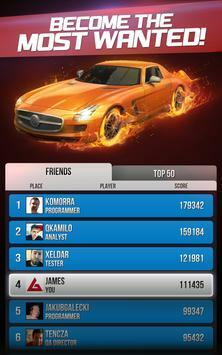 Are you the fastest getaway driver? Whether youre the good or bad guy, the actionpacked police pursuits in this free racing game will have your adrenaline pumping! Please review Highway Getaway: Police Chase Game and submit your comments below. We will collect all comments in an effort to determine whether the Highway Getaway: Police Chase app is reliable, perform as expected and deliver the promised features and functionalities.